Sweet potatoes are a heat loving summer crop. 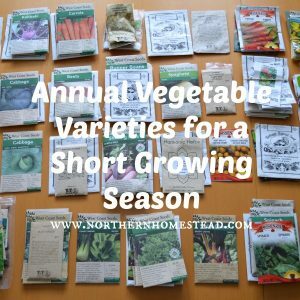 They are not suited for northern climate, nor a short growing season. Here at Northern Homestead we are dealing with both. But sweet potatoes are tasty and so good for you. 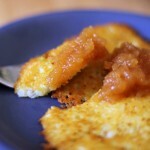 We love them baked with some homemade sour cream, yum. So why not try to grow them anyway? 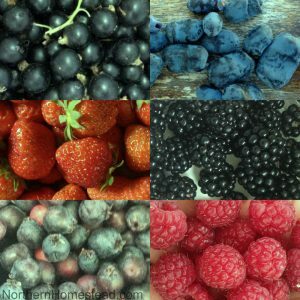 After what I consider a successful harvest, it is time to update this post. The picture below shows one of our attempts to grow sweet potatoes – looks promising to become more, doesn’t it? It did, keep on reading. One winter day we started talking about sweet potatoes in our local gardening group. I quickly learned that I wasn’t the only one that wants to grow them in our cool climate. Just a side note, those local gardening groups on facebook are so valuable, if you don’t have one, start one! You will be glad you did. 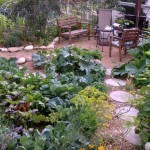 No one knows better how to grow than experienced gardeners in your area. Sweet potatoes are not potatoes at all. Potatoes are from the night shade family, sweet potatoes are from the morning glory family. There are many sweet potato varieties, but to my knowledge for short growing seasons you can only get one. Veseys seeds offers Covington, an improved early variety that will mature in short season areas with proper care. It has bright orange flesh with beautiful, deep rose coloured skin. You have to order in the slips early in spring that are shipped to you in June. I also tried a store bought organic sweet potato. I have no name for it, since stores do not tell us what variety it is. However, the Covington sweet potatoes taste really good and are suited for a cold climate. It is worth it to start with them so you have potatoes to grow next year’s slips. Sweet potatoes are grown by slips that look very much like a seedling. 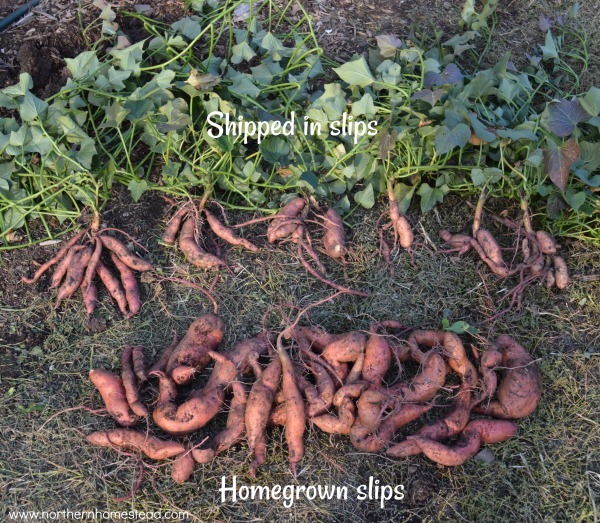 Slips are grown from a mature sweet potato. You can order slips from a seed company (see above) or grow your own. The challenge with ordering sweet potato slips from a seed company is that they ship late in the season, here in Canada in June. 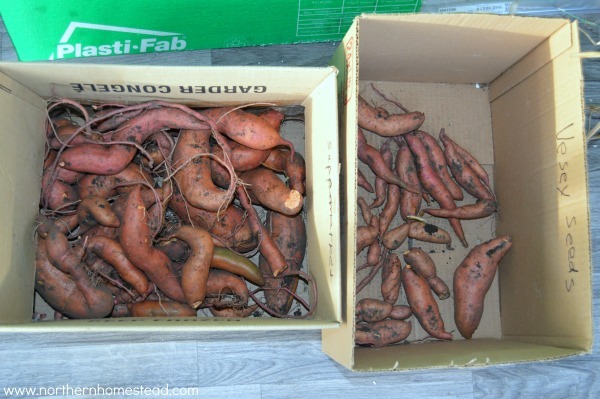 This is due to the sweet potato slips being extremely cold and frost sensitive, and the fact that they need to grow to a certain size before they can be shipped. 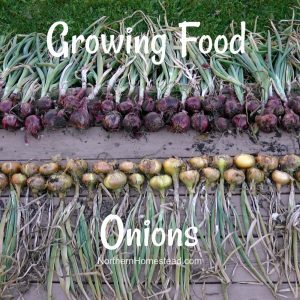 Once arrived in the mail they will often look wilted and should be placed in water to root for 4 to 5 days, or be rooted in a soiled mix for 7 to 10 days. Once the plants have begun to root they can be planted outside. If you do the math, June has almost passed by now and there are less than 90 frost free days left. 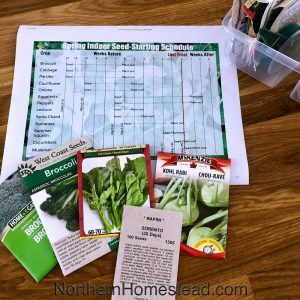 Growing your own has the advantage that you can start earlier and the slips will not have to go through a shipping shock. See picture comparison above in early June. 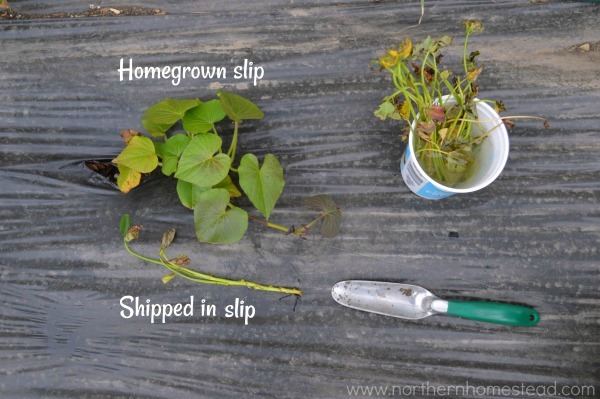 The homegrown slips were planted according to the weather a bit earlier and are healthy plants, while the shipped in slips just arrived and are struggling to survive. Growing your own sweet potato slips is way better than ordering them in. Plus, it is easy to do. 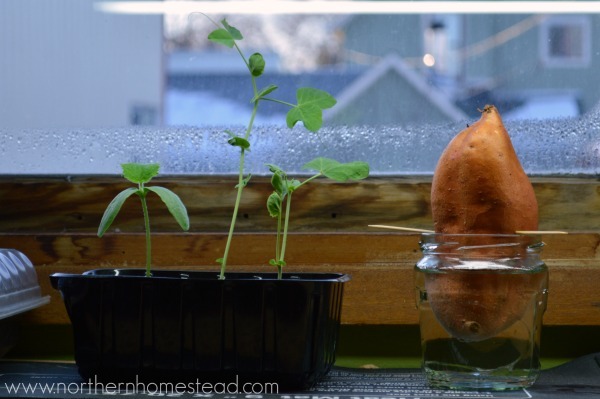 If you have grown sweet potatoes before, save a few for seedlings. Or find an organic sweet potato you like in your local store. 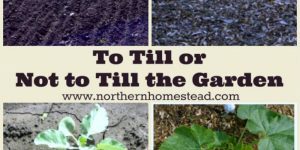 You will have to start growing the slips at least 3 months before you want to plant them. 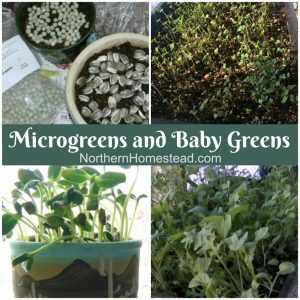 Late January to early February is a good time if you want to have seedlings, not just slips, at the end of May. 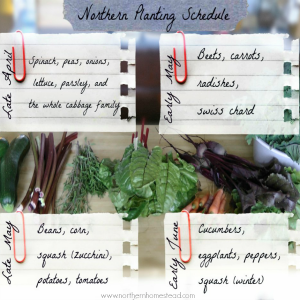 Our growing season is very short, the only way to prolong it is up front. 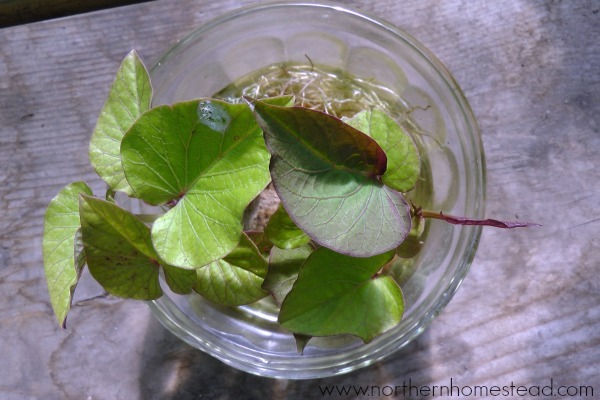 The traditional way to grow sweet potato slips is to wash the sweet potato and place half of it in water, holding it above the water with some toothpicks. It kind of looks cool that way, too. 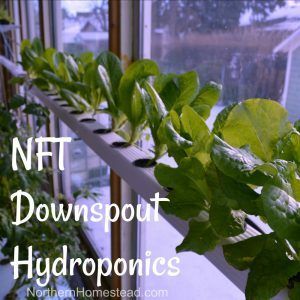 Now place the potato in a sunny window and/or under a grow light and let it grow slips till they are at least 6 inches long. I found though that the slips grew better by laying the potato down in a tray filled with soil. I used a container without draining holes so I could water the sweet potato thoroughly. 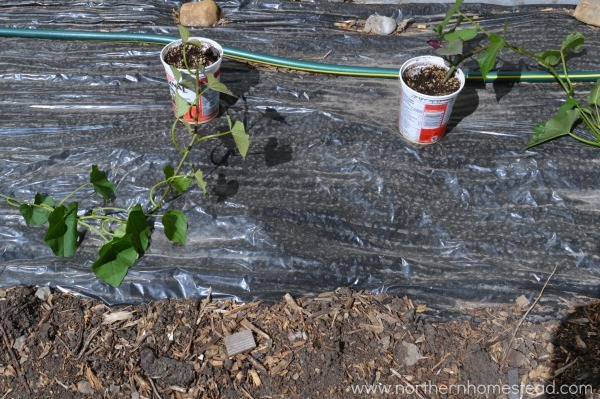 I think the very wet soil was warmer than just a glass of water, therefore the slips grew better. Once the slips are grown, take them off of the potato and place them in their own jar of water till they grow nice and healthy roots. Now they are ready to be planted. 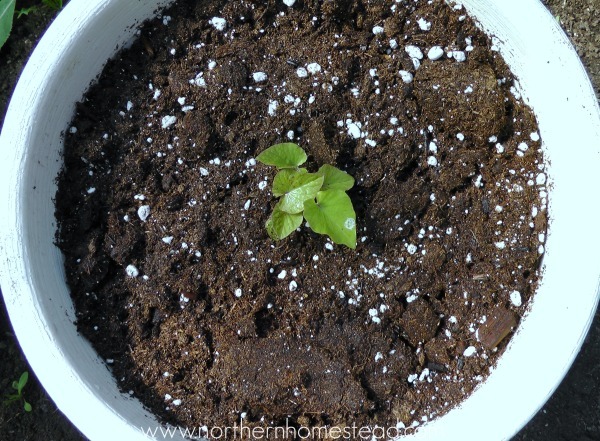 If you really want a head start on the short growing season, plant the rooted slips into a container to become a healthy plant seedling to be transplanted into the ground as soon as the weather warms up. Sweet potatoes are heat loving plants. A container has the advantage that it will warm up the soil better. If you want to grow sweet potatoes in a container, plant the rooted slip into a pot or grow bag big enough to grow nice tubers. A small pot will not do. 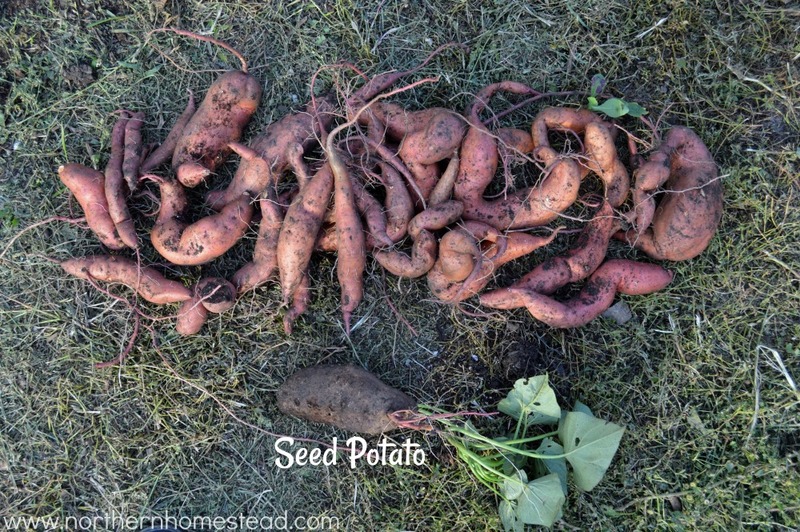 Sweet potatoes also like a loose, well drained soil. 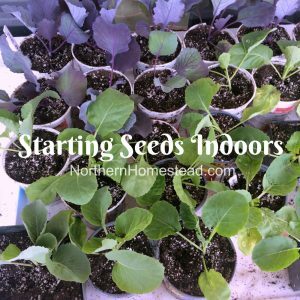 You can use a good potting soil and add some more compost to it for nutrients, or mix your own soil the Square Foot Garden way: 1/3 compost, 1/3 vermiculite, 1/3 peat moss. If grown in a container, give the plant enough room to grow. My first trial pot was too small (see picture above). Also check out the grow bags that are always better for container growing. 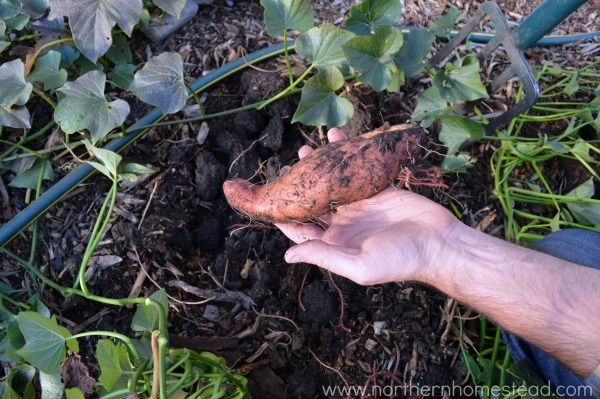 If you have a sheltered, warm location in your garden, plant the sweet potatoes directly into the ground. 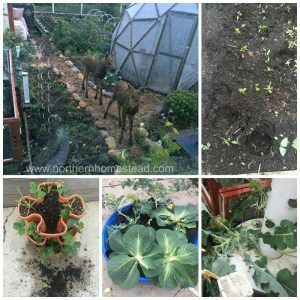 After trying a container, a grow bag, and the open ground, we found that we had far better results planting directly into the ground. As recommended, we planted the seedlings through black plastic mulch that I had covered the soil with prior to planting to warm it up. The soil has to be nice and loose. If you have heavy clay soil, add lots of good compost. 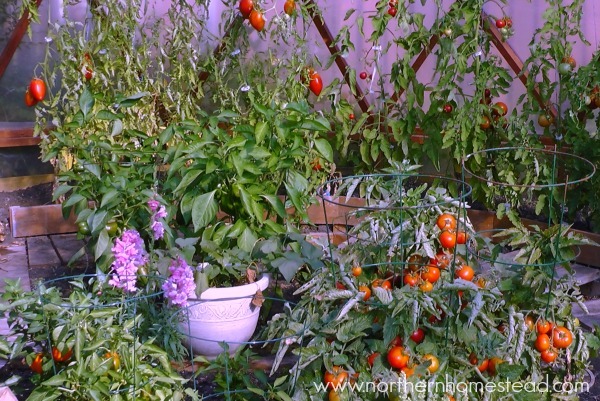 For next year’s crop we plan to build a raised bed. 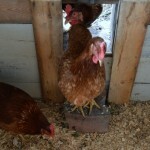 Raised beds warm up better and it is easy to have nice loose soil in them. Sweet potatoes love the heat of summer and do not tolerate any frost. The warmer, the better the harvest will be. In our area heat loving plants will need help. 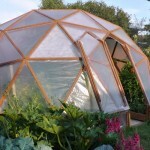 If you have a greenhouse, you can grow the sweet potatoes in there. My first try was enjoying the warmth next to tomatoes and peppers. 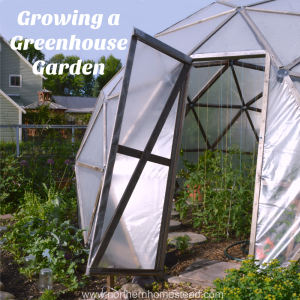 If you don’t have a greenhouse you can build a mini greenhouse or hoops for the plants. 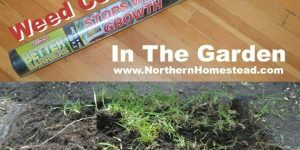 This is very important in the spring while plants are still young. 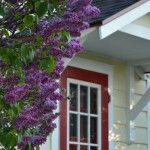 Give the plants as much protection as you can give outdoors. 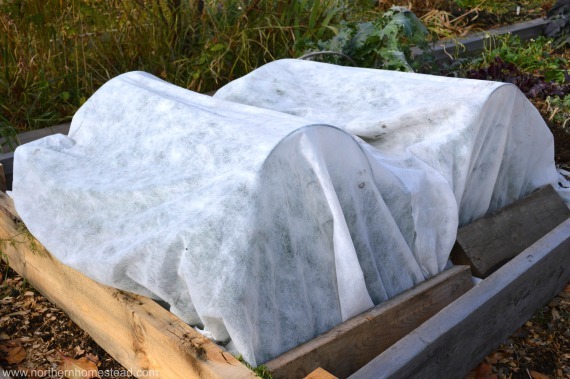 I like the Plant Protection Blanket ; it is light weight and can be left on for days, as the weather permits. You can cover a whole bed with it, or wrap individual plants. 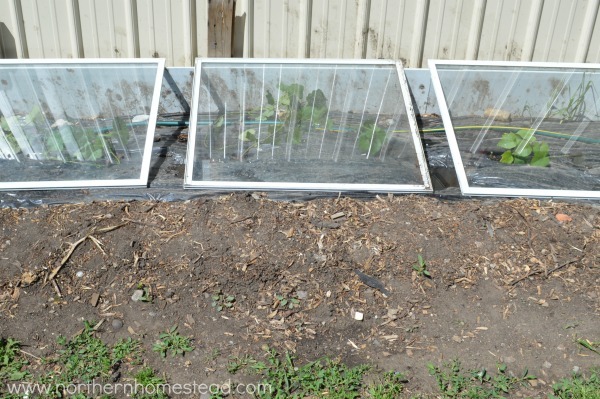 Or create a wind barrier out of recycled windows. Anything that will give the plants more heat works. Sweet potatoes are ready to harvest when the leaves start to turn yellow. However, in our area it is more likely that the weather will get cold. You can leave them till a light frost, but harvest before a hard frost. 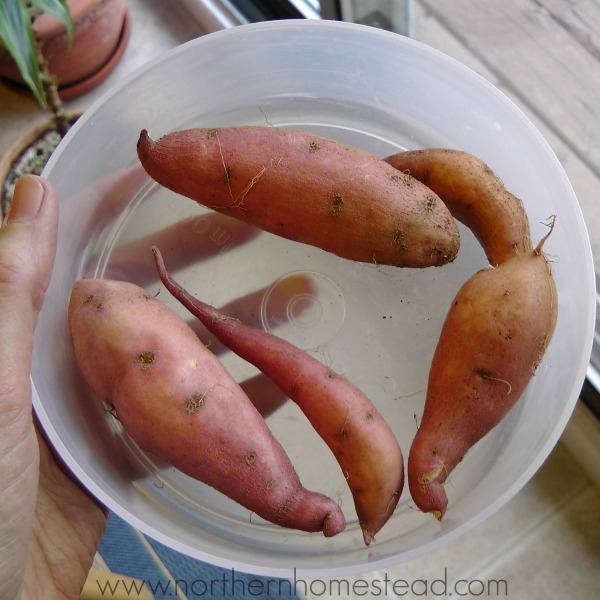 If you grew sweet potatoes in a pot, just simply empty out the pot and gather all the sweet potatoes. If grown in soil, gently dig them like you would potatoes. However, sweet potatoes are more delicate than white potatoes. They break easily and the skin at harvesting time is very thin. You might want to use a hand tool instead of a fork. Here is the harvest from the one store bought seed potato that we grew 4 seedlings from. Note, we also planted the seed potato itself, but it had no potatoes. Here is a harvest comparison picture of the potatoes grown from homegrown slips vs shipped in slips. 6 slips from the order of 10 became plants and all had some potatoes. Note, these were planted as slips, not seedlings, and also much later than my homegrown seedlings. I’m very happy with the result. It has given me enough to try them and they are delicious. Also, we got good seed potatoes for next year’s growing. Sweet potatoes are not ready to be eaten just yet. After harvest they need to be cured and rest for 8 weeks. After that they will taste great and also store well. How to cure? The ideal condition to cure sweet potatoes is an 29C (85F) degree room with 85% humidity. What? I don’t have that! Amy at tenthacrefarm has had an easy solution for years now: take plastic grocery bags, punch some holes in them, and fill them with sweet potatoes enough so that there is just one layer of them in each bag. Tie the bags closed and put them in your sunniest, warmest window. Leave it for 10 days. If it gets chilly and your windows are drafty, put a blanket or towel over them when the sun isn’t shining. 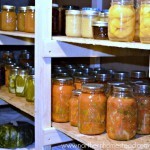 After that, store them at temperatures around 12-15C (55 – 60F), with no light, and at around 60% humidity. You can wrap them individually, or just layer them in newspapers. After the curing and resting period they will taste sweeter and have a hard skin to store well for many months. 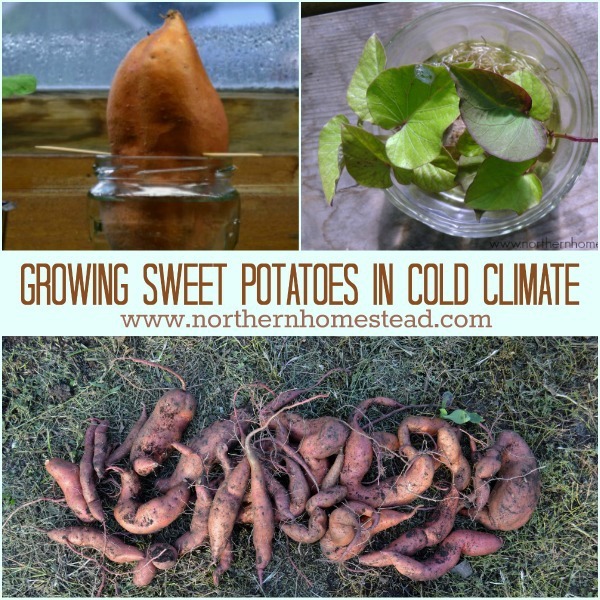 Have you grown sweet potatoes in a cold climate successfully? Please share your know-how with us. If you haven’t, maybe you want to start the adventure today! I am in southern Manitoba and I have grown sweet potatoes for the past two years from slips I started off store-bought sweet potatoes. 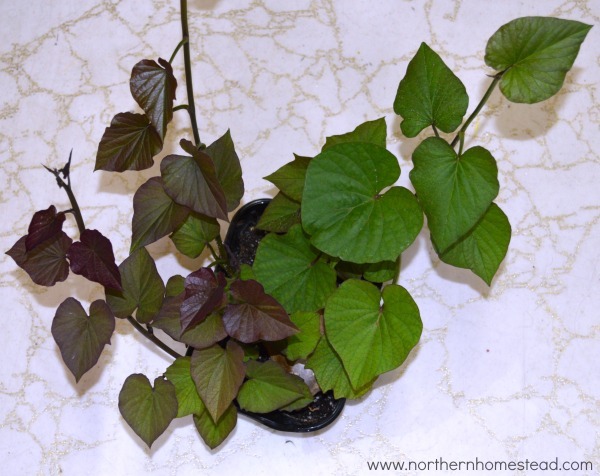 The first year I tried to just have the nice foliage in a pot and found out in the fall that there were small sweeters at the bottom of the pot and tons of root. 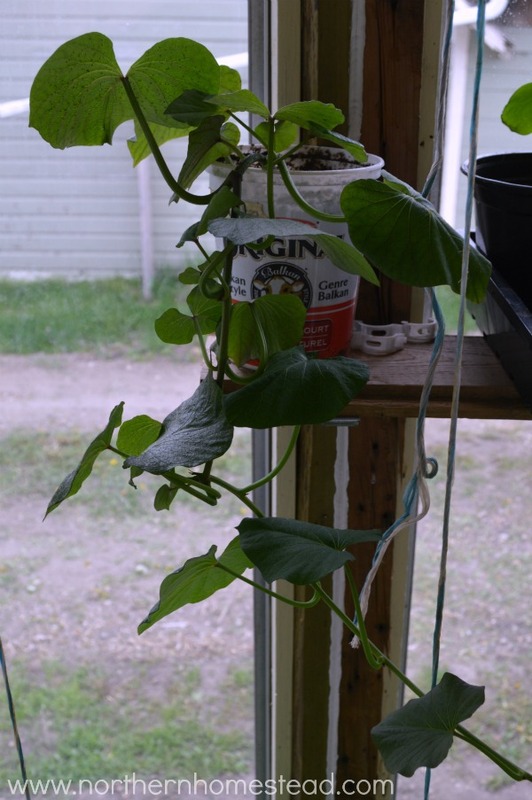 I contacted our local college professor to discuss and visit their green house where they were doing sweet potato trials to see which type was best suited for Manitoba growing. I haven’t heard the results but it was very interesting! Last summer I tried a few home-grown slips in my main garden. The foliage was great, however, the harvest was not as good as I wanted. Still, as you know, there’s nothing like a homegrown sweet potato. It’s uncertain this year, as it’s only January, if I will try sweet potatoes again but I don’t have any rooting in water yet either. Even though I have a large garden, I’m not sure if I want to give up the space it took to try the sweet potatoes again. I don’t know what your summer weather is like but our weather is all over the map these last few years. One question I have is, did your sweet potato plants flower at all? My trials did not have any flowers. Not one. Thanks for the post. Good to hear more people are trying crops in the chill of Canada. 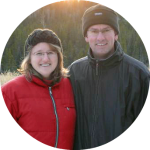 Thank you for sharing your experience, Rhonda. No my did not bloom. I think the time was way to short. I planted them in June, and that is to late for us, since our fall comes early. I plan on starting earlier with protection. I’m learning that sweet potatoes do not like heavy soil. In Canada most of our soil is heavy. That might have been your problem to get a great harvest. Something to think about. Last year I planted sweet potoatoes and then took some slips from the plants and put the slips in a water containers. They were doing very good but now the leaves are turning yellow. Please can you let me know or should I put in a container in my basement until spring. Glad to heat they did well for you. You can plant them in a small container in the house. You would at least keep them alive and get more slips to grow this summer. I grow more slips by cutting each kumara (sweet potato) in half long-ways, then soaking them all (flat side down) in a plate of water together. I need to re-fill the plate with water daily to keep them hydrated. Great tip Karen, thank you! Just discovered your amazing and informative website. Too bad it’s covered in ads. Seems hypocritical to be of the homesteading variety, when your website is pushing products that the 21st century could do without. Everyone has bills, the ads are a necessary evil. I love the articles. Thanks. Thank you Julie for your understanding. I just ignore the ads. At least they don’t cover the words, as the ads on some pages do. THAT is irritating! Very nice article, thank you. I live in Pennsylvania in the US. Not as northern as you, but zone 6B. Still, not a Southern, typical sweet potato climate. We seem to have a nice harvest, but when I read about the 85-90 deg. F curing… my heart sank… until I found this article. I will definitely do the plastic bag thing. So excited, thanks again. 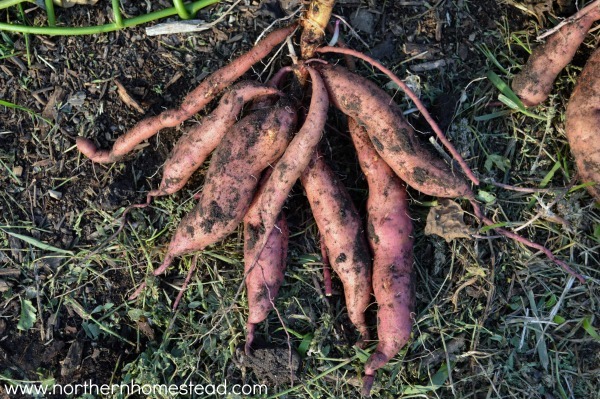 If you are looking for slips for short season varieties of sweet potatoes, do be sure to check the Mapple Farm brochure at Mapplefarm.com. They grow 10 or more kinds and are located in NB. I used to get slips from them when then shipped slips to U.S., no longer do that. I can still get their seeds, though. They grow what seeds and slips they sell, and all cool/short season adapted. Wonderful stuff. Hello, your post was just what I was looking for! I too had the oh-oh moment after I dug my sweet potatoes yesterday and went online to find out if they needed to be cured & how. Michigan’s Upper Peninsula is only 80 and sunny at some points in the summer and our house is now at 65 with the heat on in October. I’m going to give the plastic bags a try, though we don’t have much sun coming up this week. I had put them in a box near a heater vent yesterday, but that would tend to dry them out. I had no idea they needed a high heat and humidity curing–should have checked that out first! We are zone 4a/4b mostly due to being just a few blocks in from Lake Michigan on the southern edge of the Upper Peninsula, otherwise zone 3 in most of the central U.P. I’ve tried sweet potatoes before in the ground without much luck but this year I put four rooted/potted plants (from the garden center, not sure what variety), in two black plastic large pots (approx. 20″ across) and set the pots on the edge of the asphalt driveway bordering the back lawn for extra warmth, plus we had a warm summer too. That seemed to do the trick because I got about 15 pounds of them all total from the $4.97 purchase cost and we pay well over a dollar a pound up here for them in the store, about .99 per pound on sale. If I can find the plants next year I will put each plant singly in pots though, planting right in the center, instead of 2 per pot as there are some curvy sweet potatoes from growing around the sides of the pot! I did notice that they didn’t grow to any great depth though, so old washtubs would work great I think.–wider but shallower. They will all taste good regardless of shape though and some of them are enough for 2-3 servings each. Very happy with results! 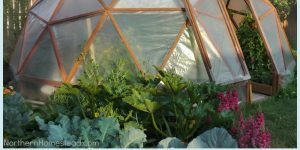 I also often grow okra under clear plastic tunnels until mid-summer and get enough for a few meals of fried okra plus some for gumbos–nothing outstanding but it’s also very hard to find in good fresh shape here in the U.P. I use the fastest maturing date seeds, which have gotten much better in recent years than the traditional Clemson Spineless. Annie Oakley variety has proven to do the best for me here in the far North, with some success with Lee variety also. Thanks for the sweet potato info! I have tried growing sweet potatoes three years in a row. Only had success the first year when we had rain and a really hot summer. Thanks for all your tips, going to try again. Im in southern Saskatchewan. Have my tubers in water on the window sill already. 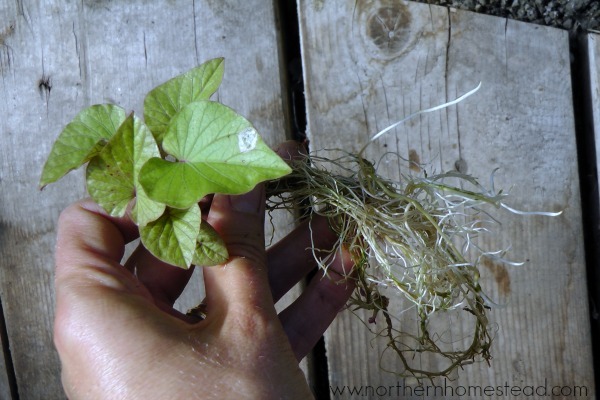 Will root the slips and plant them in pots for the spring. I have tried them in the garden and pots, both have the same amount of minimal success. What makes me continue trying? I love how they taste from the garden. Good for you to keep trying. I think starting them in pots could make a difference for you. We also water ours.